The best eye shadow make up tips to keep your skin looking youthful and fresh. Try these eyeshadow tips to keep your makeup in place and look pretty all day! Getting your eye makeup just perfect can be the difference between a gorgeous overall look, and the look of an amateur. On some days, your skin might look dull, be flaky beneath your makeup, or have crows feet popping up here and there. Sometimes your eye makeup might look a little off color or just not blend the right way. Here are a few eye shadow make up tips to keep your look fresh, glowing, and perfect. There is nothing worse than excitedly buying a new makeup or trying to rush out the door, only to realize that your foundation or shadow is actually highlighting the lines around your eyes! These are things we women take great precautions to eliminate and hide on a regular basis for the sake of beauty. Here are a few eye make up ideas to try if this happens. First, make sure you are using a night cream before bed. Skimping on this, whether you are 20 or 50, can take its toll on your eyes. If you've applied your makeup and you see some accentuated lines here and there, dab a little daily moisture on the area, and very gently smooth from side to side either with your finger tip or a clean makeup sponge. This will fill in your creases and still keep your makeup in place. Add a touch more shadow here if needed. These eye shadow make up tips should have you on the right path in no time. If your complexion needs a little boost throughout the day, try using this makeup artist approved method of contouring and highlighting your face. First, use a large face brush to sweep some blush onto the apples of your cheeks and lightly up your cheekbone, swirling in a circular motion. 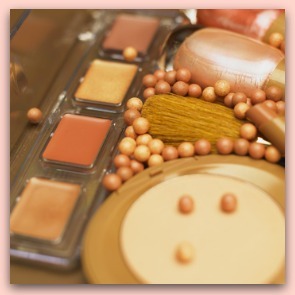 Make sure you have chosen a blush that is right for your skin tone, not too pink and not too neutral. Next, apply a small amount of bronzer just below your cheekbone and the blush. You want to lightly darken the skin from the apples of your cheeks towards the tops of your ears to contour your face, making it appear slimmer. For a glamorous glow, use a small eyeshadow brush and apply a little bit of highlighter to the very top of your cheekbones, just below your eye. Work in a short diagonal slant that points towards the tip of your nose and your temple, but doesn't span more than two inches. There is nothing more frustrating than applying your makeup perfectly in the morning, only to see that by afternoon your eyeshadow is forming ugly creases on your lids, your liner is smudging down into small raccoon eyes, and there are tiny flecks of mascara chips settling on your cheeks. The first thing to do is buy a brand new mascara for that problem, but for the others, your shadows and eyeliners aren't to blame. As the body produces oils throughout the day, your eyelids become slippery ground for makeup to be resting on. The solution is to use an eye primer before applying any makeup to keep your lids dry and to “grab” your makeup. Professional makeup artists know how beneficial face and eye primers can be, and won't be seen making up celebrities without them. We like Nars Smudge Proof Eyeshadow Base, $24, and Urban Decay Eyeshadow Primer Potion at Sephora, $18. Return to Makeup Tips Home from "Eye Shadow Make Up Tips"